My Ram, this is the Milk we ought to churn! "Those who die to the World and become alive in the Presence of Ram, merge into the Formlessness of Ram. Those who remain Pure - Truthful, Responsible and Blissful - in this world, they never fall into the terrifying ocean of Meaningless Suffering. My Ram, this is the Milk we ought to churn! Through the Guru's teachings, we can cultivate a steady mind, a concentrated mind, free from distractions, and in this way, we can have a drink of the Amrit, the Timeless State of Consciousness." In this painting, Guru Amar Das ji stirs the milk in pure devotion to Hari, while (Guru ji's wife) Mata Mansa Devi ji brings forth the rice to add to the milk, to make kheer (pudding). Guru Pita ji provides the spirit and Mata ji provides the material, and together this results in something beautiful. Waheguru stirs the Ocean of Milk. From this stirring, come various elements. One of these elements is Amrit, that Timeless Quality of Consciousness. The wicked ones try to steal it from the Saints however Waheguru makes sure to steal it back from those who have Enmity within their Hearts and perform Actions laced with Anger, Greed and Lust. He gives Amrit to his Saints, who chant the name of Hari and perform Pure Actions, actions that are Truthful, Responsible and Blissful. Langar is an old Indian tradition. But in the Sikh tradition, it has a very special and significant place. Many stories of the Gurus revolve around Langar, the process, the devotion, the servitude and the pureness of Being, that goes into cooking Langar. It is said that when Pita Kalu ji gave Guru Nanak Dev ji a whole bunch of funds to start his own business, the Master of Seli and Topi spent all of it on feeding and clothing Sadhus, the Saints of the Lord. In this painting, Guru Nanak Dev ji brings Dal (lentil soup) to the congregation, to the Sadhus. Guru Lehna ji (later Guru Angad Dev ji) demonstrated his devotion, dedication and divinity through Langar. Prior to meeting Guru Nanak Dev ji, Lehna ji was a Guru himself and commanded a following of his own. Despite having such status, he became a mere Servant in Guru Nanak Dev ji's kitchen. When no one would do the job, he was there in the thick of it, doing the grueling and messy work of collecting materials for Langar. The former Guru became a servant and a part, angad, of Guru Nanak Dev ji, and thus, he was given leadership of Guru ji's own following. 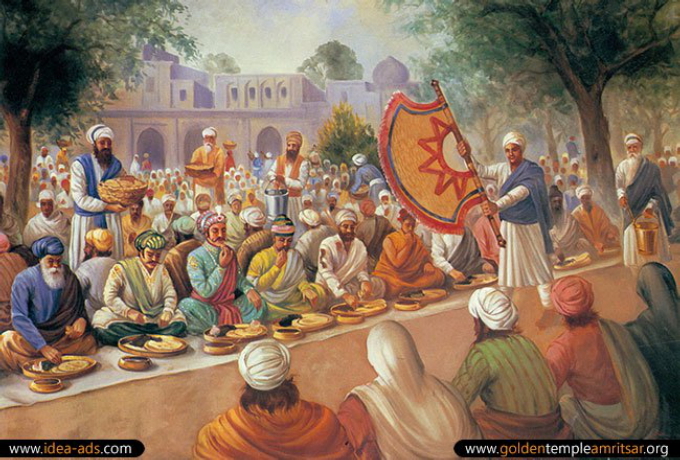 In this painting, Lehna ji (Guru Angad Dev ji) hands out Chapatis (bread) to the congregation. Bhai Amar ji (also Bhai Amru ji, later Guru Amar Das ji or Guru Amar Dev ji) followed in the footsteps of Guru Angad Dev ji. He meditated on Ram, and performed Responsible Actions, and became a complete servant of the Guru. Guru Angad Dev ji became so impressed by Bhai Amru's devotion, his dedication and the divinity shining from within him, that he made him the next Guru of the Sikhs. In the time period of this painting, Bhai Jetha ji (later Guru Ram Das ji) has not yet been given Guruship. In the painting, Jetha ji is seen standing in front of the Guru's house. He collects the Chapatis from Bibi Bhani ji, his wife, the daughter of Guru Amar Das ji, who is cooking them on the hot plate. When Guru Amar Das ji attained the Throne of the Guru, he amplified the Langar tradition and made it a regular part of the community. He required that everyone who wanted to see him, join the langar first before joining the congregation. Guru ji made everyone, belonging to different social class, caste and religion, sit together and eat together and pray together. He eliminated the tensions between groups and created a heavenly atmosphere. Even the Emperor of India, Akbar, had to take part in Langar before seeing Guru Sahib. In this painting, the Emperor sits amongst the poor and the Sadhus, the Hindus and the Muslims, and eats off a simple leaf-plate and patiently awaits more servings. The advancements made by Guru ji made Langar a critical part of Sikh discipline. Performing Seva, selfless service, in Langar and not being afraid to get yourself dirty in the process, is of great spiritual value, which was demonstrated strongly by Guru Angad Dev ji and Guru Amar Das ji. Sikhs took this technology that their Gurus brought to them and amplified it even further. Today Sikh Panth is feeding millions of people daily with free meals. This is one of the greatest achievements for not only Sikh community but the whole of mankind itself. I started this painting of Guru Amar Das ji back in 2010! As I painted and re-painted it, it went through many many changes. A big change was the change of setting. Originally I had imagined the Langar Kitchen set in a building akin to modern kitchens in old Gurudwaras. But later I stumbled upon some resources that suggested that the the setting would be very different from where we cook langar nowadays. The kitchen would have been built outside, and the langar would have been cooked in the open air, at least for a large congregation. So I imagined the kitchen under the shade of a large tree, with the sangati eating the langar on one side and buffalo on the other. There is the creation of the langar (the buffalo), the people who process the langar (the sevadars) and those who consume it (the congregation). Guru Amar Das ji is cooking kheer, and is flanked by his sikhs, who are preparing the dough and creating chapatis. Behind Guru Amar Das ji, we see important figures, one of whom is Mata Mansa Devi ji who is bringing rice in her jholi. I imagined this scene like the scene of Vaisakhi, where Guru Gobind Singh ji stirred the water and his wife, Mata Sahib Devi brought the patashay in her jholi, to add to the water. In this way, Guru Amar Das ji stirs the kheer while his wife, Mata Mansa Devi ji brings the rice to add to it.